Saddleback’s playground needs replacement and the park is due for an upgrade. In Late 2016 in anticipation of the need for a new park the Town of Peace River launched a survey for residents to offer feedback on components from three different designs. The survey was extended into January 2016 and received close to 300 responses. Through the winter and spring, a concept and costing plan was put together, then taken before Town Council for review and input. Over the summer a design was approved, with an estimated cost of $406,835, which we’re excited to share below. In the fall and winter funds to build the park will need to be allocated in the 2017-2018 Capital Budget which will outline the timeline and phases needed for construction with the plan to have shovels in the ground as soon as possible in 2018. Click the image above to view the high-resolution PDF. We would like to thank everyone who took time out to answer the survey and contributed their thoughts and ideas to this design. 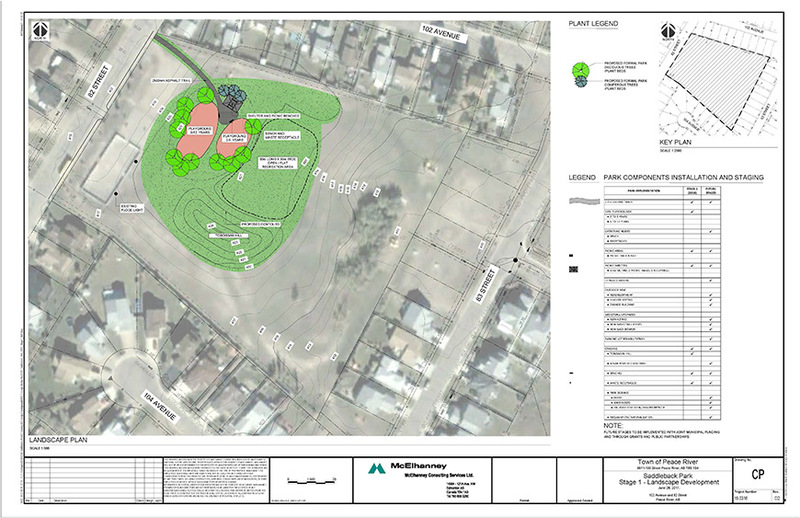 Parks are neighbourhood gathering spaces, important community cornerstones, this new park will make a wonderful addition to the Saddleback neighbourhood.